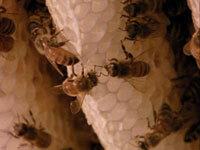 The role of honeybees in a common garden. With their intricate dance of communication, their flight patterns requiring sophisticated navigation and their prolific pollen gathering abilities, honeybees are some of the most active and mysterious creatures in the garden. In this episode we join the sisterhood to intimately explore the role of honeybees in a common garden. We'll even set up a sting to find the hive where these pollen bandits stash the loot. 7. Garden Mimics - More than meets the eye.